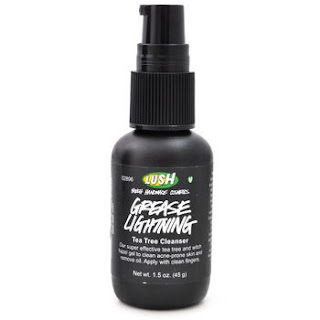 The other day I got a question about the Lush skincare products I use. Currently in my routine I use Fresh farmacy cleanser, Grease Lightning spot treatment, and Tea Tree Water and Breath of Fresh Air toners. Fresh Farmacy is a bar they sell by weight, like their soaps. It's pink and has a light lavender scent. Its goal is to calm problematic skin with ingredients that include calamine powder, chamomile, lavender, and tea tree oil. With my skin type, that sounds like a gold mine! After you wash your face with this bar, it leaves that tight squeaky feeling which some people don't like, but I'm a fan because it feels clean! This is a harsh cleanser, so use with caution. I find that Fresh Farmacy helps me with breakouts and eczema symptoms. It works slowly and you don't see changes over night, but then one day you wake up and you feel your soft face and see a glow. 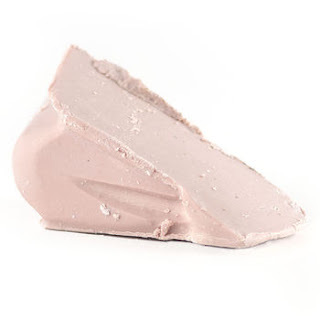 I think price wise it's really great because it lasts forever as long as you cut it up in pieces and only use a small piece at a time, and keep it dry when storing it (like any other solid Lush product). I recommend to definitely ask a Lush employee for a sample before committing to buying a full bar since this product is such a hit or miss for people. After I use Fresh Farmacy, I use Grease Lighting spot treatment. Instead of using this as a spot treatment though, I put a thin layer around my cheeks and chin since those are the places I have my breakouts. This product has thyme, rosemary, tea tree oil, lavender, and witch hazel, all mixed into aloe vera gel with grapeseed oil. Hot damn! Every single one of those ingredients has anti bacterial and soothing properties. Because of that, this product is also harsh and drying. I'm pretty sure Grease Lightning has been a major player in controlling my acne. It's become one of my favorite skincare products. This is a little pricier than drugstore though. Also, if you use it like me, two times a day all over, it doesn't last long. But I bet as a spot treatment it must last forever. On to the toners. Tea tree water is again for acne and troubled skin so it's anti bacterial, while Breath of Fresh Air is soothing. I like using Breath of Fresh Air the morning before makeup to freshen up, and then spray it again after if it looks too cakey/powdery. It's not really a setting spray, just looks more natural. I use Tea Tree Water at night after I wash my face and after Grease Lightning. I also use it for those days I lose my picking battles. After picking, you leave pores exposed, dirty, and in risk of getting infected so this toner helps prevent that. These two are not necessary to my routine, they were just impulse buys I had while at a Lush. But that doesn't mean I'll be giving them up easily. The information provided here is of great use. Such a great interesting post! <a href=" www.earthsapothecary.com”> skincare products </a> is sustainable lifestyle brand and system.